On Wednesday 8th March, 2017 Derry Clarke visited our school. Our class and the 1st years who do Home Economics were lucky enough to be at the 2 hour demonstration he gave. Some of our teachers who were free came in too. Derry told us that he started out washing pots during his summer holidays when he was 13 in a restaurant in Kinsale, Co. Cork. At the age of 15 he had decided he wanted to be a chef. He trained and worked hard to achieve his goal. He now owns and runs his own Michelin star restaurant “L’Ecrivain” on Baggot Street in the city. During his demonstration he cooked Roast Red Pepper soup with Chorizo and white beans. He also made stuffed chicken breasts wrapped in bacon with mustard and honey glaze and a Banoffi sundae. He showed us how to cook the perfect steak. He got some of us to volunteer to help him. There were a lot of us willing to help! We asked loads of questions and Derry was happy to answer them all. He was surprised by how much we knew about the foods he was using. Derry was asked by one lad was he “better than Gordon Ramsey?” and he answered “who is Gordon Ramsey! This got a good laugh. We got some good tips for our Home Economics classes in the future like putting a damp towel under a chopping board to stop it slipping. We also learned that Derry loves salt!! Poor Aaron had a sore arm seasoning the steak. We were so lucky to get a taste of all the food that Derry made and it was delicious especially the steak and the sundae. At the end of the demonstration Derry let us take photos and he gave us autographs. We thought Derry was a very nice, down to earth, kind and generous person. 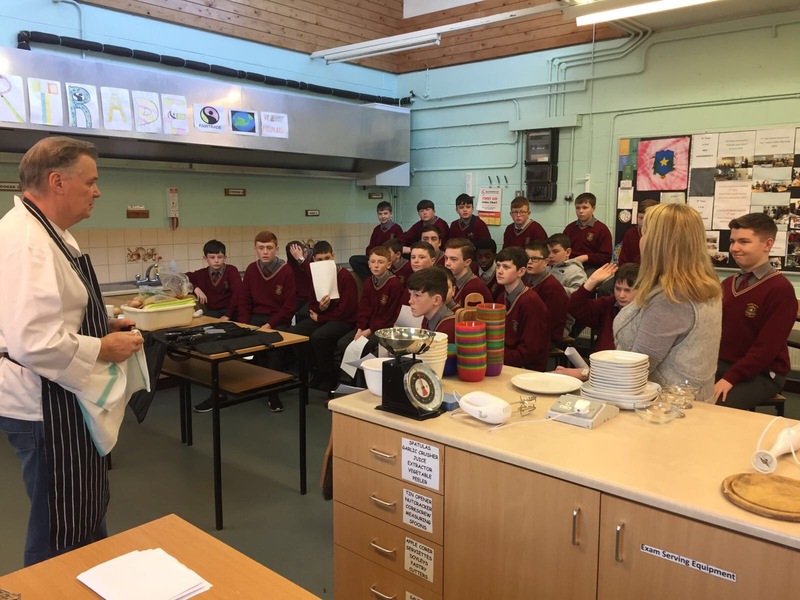 All in all, it was a real privilege to welcome Derry to St. John’s College Home Economics room and an experience we will all remember. 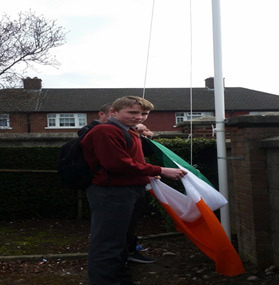 In commemoration of the 1916 rising St Johns College DLS celebrated the event by holding a number of activities throughout the day on Tuesday 15th of March. 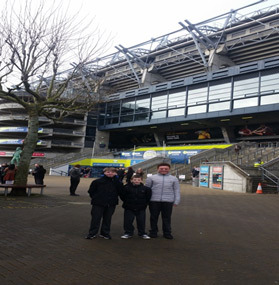 Prior to this 3 students, Aaron Reynolds, Aaron Nolan and Aaron ***** accompanied two teachers to the flag raising ceremony in Croke Park to collect a flag from the Thomas F Meagher foundation which the president Michael D Higgins was in attendance along with many other famous faces like Ryan Tubridy! Each classroom in the school was named after a significant person during the struggle for an independent Ireland with the help of the transition years and the history classes! On the commemoration day we held a flag raising ceremony which all second years attended. Shane Rowe did the honours of raising the flag above our school while first years sang our national anthem. 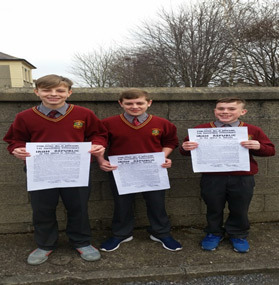 Three second year students very eloquently read out our Proclamation, Lee Burke, Dylan Byrne and Nathan Heneghan. 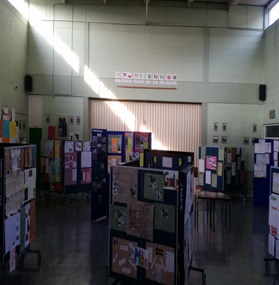 Following lunch time, all the projects which individual students, history classes and other subject teachers had worked extremely hard on in the months leading up to the commemoration were displayed in the table tennis area. All students came down to view the projects throughout the day along with the videos the history classes had made! We were even treated to a bit of ceili dancing by some of our transition years! Transition Year was a liberating experience despite its minor faults which were easily eclipsed by the benefits that this Year had to offer. Personally, I spent more time outside of the classroom than I had inside. This was a welcomed change! While this experience is unique to each person, I can proudly say that I enjoyed the diverse modules such as IT and Road Safety (to name a few) as well as the enthusiasm that the staff had when teaching these subjects. Independence, self-learning as well as public speaking are all prevalent throughout all modules with the exception of Physical Education – PE was a great addition to the Senior Time Table. The Work Experience weeks added to the eclectic mix of module projects/assignments. What I liked the most from TY is the mixed class groups. This enabled the access to a wider skill set which is important for doing module projects. You also weren’t stuck with your base class for your first year as a Senior Student (this was a simple yet innovative concept).Overall, I think that it’s fair to say that TY breaks the preconception that we, as students, have about secondary school. It introduces a change to the School > Homework > “Study” > Entertainment cycle that we have had ever since we started First Year. It is a skipping stone that eases the trek to Senior Year. The opportunities and projects and experiences, when met with an optimistic attitude, lights a beacon that makes our future that much brighter.